Toni Kroos announced that he will play for Real Madrid next season, even though his agent insists that the move is not a done deal. The 24-year-old Bayern Munich midfielder had an outstanding World Cup 2014, scoring two goals and providing four assists en-route to a World Cup victory. Kroos had been linked with Real Madrid and English Premier League sides Manchester United and Chelsea for a couple of weeks, but has insisted that he will only comment on his football future after the World Cup. 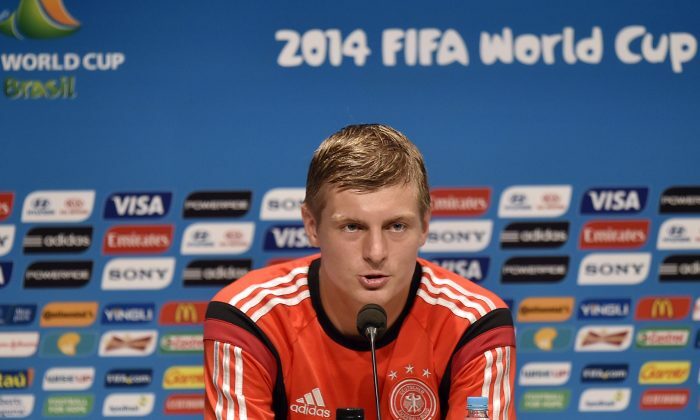 Kroos’ agent Volker Struth has however denied that the Real Madrid move is a done deal. “We’ll sit down and decide what’s to be done. RIO DE JANEIRO (AP) — Mario Goetze produced the piece of individual skill that Lionel Messi couldn’t muster. With two quick, deft touches, Goetze ended Germany’s 24-year wait for another World Cup title with an extra-time winner against Argentina on Sunday — denying Messi the one title he needs to forever take his place among the game’s all-time greats. It was the moment of brilliance that ensured Germany’s 1-0 victory in a tight and tense final. Goetze, who wasn’t born when West Germany beat Argentina in the 1990 final, controlled a cross with his chest in the 113th minute and in one fluid motion volleyed the ball past goalkeeper Sergio Romero and inside the far post from five yards out. It delivered Germany its fourth World Cup title, equal second with Italy on the list of all-time champions and just behind Brazil’s five. At the final whistle, Germany players fell into a pile in a mid-pitch celebration. Messi walked past them with his hands on his hips — still in the shadow of his compatriot Diego Maradona, who led his country to the 1986 title. The 22-year-old Goetze went on as a substitute for Miroslav Klose near the end of regulation time and his fresh legs made the difference. Andre Schuerrle broke down the left flank, sending his cross into the area, and the Bayern Munich midfielder did the rest with a clinical finish. The goal echoed that of Andres Iniesta four years ago, when the midfielder scored in similar fashion but from the other side of the area to give Spain a 1-0 extra-time win over the Netherlands. It went entirely to script, according to Germany coach Joachim Loew. Germany became the first European team to win a World Cup in the Americas, and the victory ends a string of near misses since winning its last major title at the 1996 European Championship. The team lost the 2002 World Cup final to Brazil, the Euro 2008 final to Spain and was eliminated in the semifinals in both 2006 and 2010. It is Germany’s first World Cup title as a unified nation, having won as West Germany in 1954, 1974 and 1990. The Germans faced Argentina in both the 1986 and 1990 finals, during Maradona’s heyday. This time, they were up against Messi, the four-time world player of the year who has set a slew of scoring records in leading Barcelona to every major club title and is widely considered the best player since Maradona. He had one good chance to score when he was sent free in the area just after the halftime break, but sent his shot wide. It was a difficult angle, but still the type of chance he so often converts for Barcelona. Messi threatened intermittently throughout the match, but was effectively smothered by the German defense. His free kick in the 120th minute went well high. Messi, who scored four goals in the group stage but none in the knockout rounds, then had to trudge alone up the stairs of the Maracana Stadium to accept the Golden Ball award for the tournament’s best player, shaking hands with German Chancellor Angela Merkel along the way. “At this moment I don’t care about this prize — only lifting the trophy matters,” Messi said. “I’m hurt for losing the way we did. … I think we deserved a little better, we had chances. As well as they controlled the ball, we still had the clearest chances.” After Messi received his award, the German team made its way up the stairs for captain Philipp Lahm to raise the hallowed 18-carat gold trophy. Until Goetze’s winning goal, the game was more notable for top-class defending than creative attacking, but both teams had their share of chances. Gonzalo Higuain fired wide when gifted a chance in a one-on-one with goalkeeper Manuel Neuer, and later had a goal ruled out for offside. Germany defender Benedikt Hoewedes hit the post just before halftime with a header. Germany had entered the game as the favorite after its 7-1 semifinal drubbing of Brazil. But Argentina proved to be an entirely different proposition. After Germany’s last win in 1990, then-coach Franz Beckenbauer predicted that a unified Germany would be “unbeatable” in the future. It took 24 years to prove him right but with young players like Goetze, the next wait may not be as long. “We, I think, deserve this trophy,” Goetze said. Germany: Manuel Neuer; Philipp Lahm, Mats Hummels, Jerome Boateng, Benedikt Hoewedes; Christoph Kramer (Andre Schuerrle, 31), Bastian Schweinsteiger, Toni Kroos, Mesut Ozil (Per Mertesacker, 120), Thomas Mueller; Miroslav Klose (Mario Goetze, 88). Argentina: Sergio Romero; Pablo Zabaleta, Martin Demichelis, Ezequiel Garay, Marcos Rojo; Lucas Biglia, Javier Mascherano, Enzo Perez (Fernando Gago, 86); Ezequiel Lavezzi (Sergio Aguero, 46), Gonzalo Higuain (Rodrigo Palacio, 78), Lionel Messi.